Clicks, taps, swipes, form submissions, page views. You’re no longer limited by events you thought to log upfront. Interesting indeed! As per my knowledge, no other Analytics tool automatically capture every user action that is happening on your website and app, let alone going back retrospectively to check the data of how many clicks a particular button. In Google Analytics, you have to set up an event tracking to a particular button that you want to track and tag that button with a code to push the data into GA. Similar concept apply to Adobe Analytics as well. With Google Tag Manager, it is possible to track every single click with click and link click listeners (please see my post here if you are using old GTM and here if you are using new GTM) but you can check historical data of a particular button before you implement GTM. Heap Analytics also has an impressive list of clients and testimonials on this page so at this point, I am really interested in this and want to get my hands dirty playing with it. The tool is free if your website/app has less than 5,000 sessions per month and if you have more than that, they have tiered pricing system which looks reasonable. So I signed up for free plan and decided to track this website with the tool. The below are my observations and understanding of how the tool works and pros/cons. Once you have installed the tool, you are being redirected to main reporting interface. Here I will breakdown each report/feature and pros/cons. Yes, it is true that Heap will track every single item clickable on your website. However, you can also use Event Visualizer tool to define the names of these events for particular buttons and track them as your own Events. They will first ask you to check on which URL you want to load Event Visualizer. And then, on the screen you will see something similar to below. If you click on particular button, it will show how many people clicked this button in past week (historic data) and you can also define your own name for that button. You can also choose to track element classes and link (if there is any) tied to this button in more options. You can also limit to track a button on current page or ignore the containers. 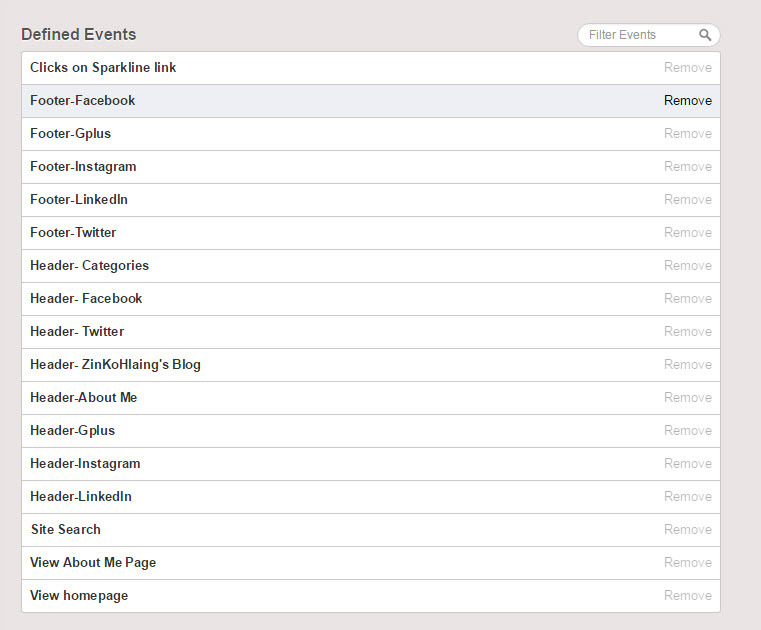 Once you have defined all the events that you want to track, it will sit under Events Report as shown below. Pros: It is a great tool because I can visualize the events that I want to track with specific names. Also, +1 for historic data display. Cons: It is good if you have only few buttons to track (like mine) but it could be a nightmare if you want to track multiple events on every page. Sure enough, the tool itself will still track every clicks, just not with the names that you want to associate these clicks. This is where all your defined Events sit under. Also, the tool will suggest events that you can track. The below are some of the events options that you can choose to track. Pros: There literally are a lot of things that you can track with these options. You can define events based on CSS Selector (if you selected Click on, Change on), events based on form submission and even events combination! This is quite powerful if you want to track multiple things from one place if you understand your site CSS and HTML structure. Cons: You will also see that there is “View page” option as an event type. Yes, this is right. There is no Pageview tag or anything like that in Heap Analytics. Heap Analytics also treats pageviews as events which complicates matters slightly.